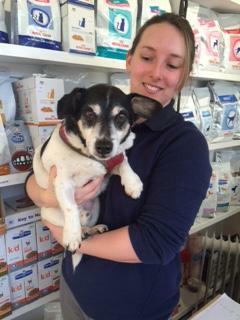 Chip, a Jack Russell Terrier came into us one afternoon having been a little lethargic. On closer examination his gums were almost white in colour, and his heart rate was much faster than it should have been and he had developed a heart murmur as a result of the anaemia. We admitted Chip straight away to investigate further, as with any marked anaemia there was a risk there may have been blood loss through internal bleeding, reduced production or loss entirely of red blood cells. In addition to all this, with reduced oxygen delivery to all areas of the body, poor Chip was also at major risk from organ failure. Our initial blood tests confirmed that Chip was severely anaemic, there were huge levels of bilirubin (the breakdown product of haemoglobin from red blood cell destruction) present and his liver enzymes were raised quite a way above normal. Chip’s urine sample was extremely bright orange/brown in colour as well, raising our suspicions of haemolytic anaemia. Following further investigations with ultrasound and another special blood test, we concluded that Chip had developed ‘Immune-mediated Haemolytic Anaemia’, also known as ‘IMHA’. IMHA is a very serious and life-threatening condition, and in up to 75% of cases has absolutely no initiating cause. In the other 25% of cases it can be brought on by some cancers or inflammatory conditions such as pancreatitis. Fortunately in Chip’s case we found no inciting cause! However prognosis even then can be as low as 50-88% of cases surviving to cure. We started Chip on a very high dose of immunosuppressant medication in order to try and reduce the rate at which his body was destroying his own red blood cells. 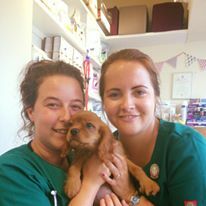 Often in these cases patients require blood transfusions and we prepared ourselves in case the requirement for this arose, but Chip was such a little fighter he showed no further signs of struggling with his anaemia! Chip went home on an oral version of his immunosuppressant corticosteroids and has been doing well ever since! He is still having to come in every few weeks (much to his enjoyment may we add – he loves all the fuss!) for us to check his PCV, and we have been very gradually reducing his medication down over the past couple of months. We hope that by mid-summer he will be off them altogether! But until then he’s been our little star! Hugo came to us as a tiny 6-week old puppy who was struggling to breathe. He was a very poorly little boy and needed to go straight into an Oxygen cage. We took some blood out of a very tiny vein and took a radiograph of his chest. The x-ray showed a severe pneumonia and it was really touch and go if he would survive. We gave him an intessive treatment regimen including a baby inhaler and he gradually began to improve. We are delighted to say that he is the picture of health now and going to live life to the full!